Progress billing occurs when you actually invoice, or bill, a customer for a portion of an amount that you’ve previously estimated. 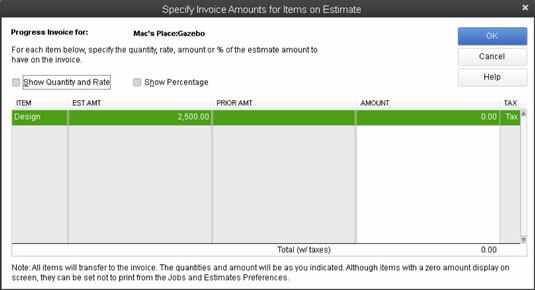 For example, take a peek at the QuickBooks 2013 Create Estimates window. Suppose that this window records an estimate that a client has asked you to supply. Further suppose, just for purposes of this discussion, that the estimate is for a consulting job that you’re doing. 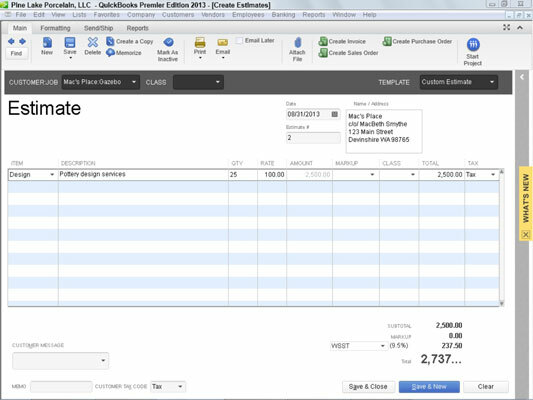 If you select Create Invoice for the Entire Estimate (100%), QuickBooks creates one invoice that uses all the information from the Create Estimates window. Or you can select one of the other options to bill only a portion of the estimate. Alternatively, you can select the Create Invoice for Selected Items or for Different Percentages of Each Item radio button. In this case, QuickBooks lets you specify that different percentages of the items shown on the estimate should be billed. When you click OK, QuickBooks either creates the invoice by using the estimate information or (if you indicated that you wanted to specify different percentages for different items on the invoice) displays the Specify Invoice Amounts for Items on Estimate dialog box. You use the Amount column to specify a portion of the estimated amount that you want to bill on the progress invoice.